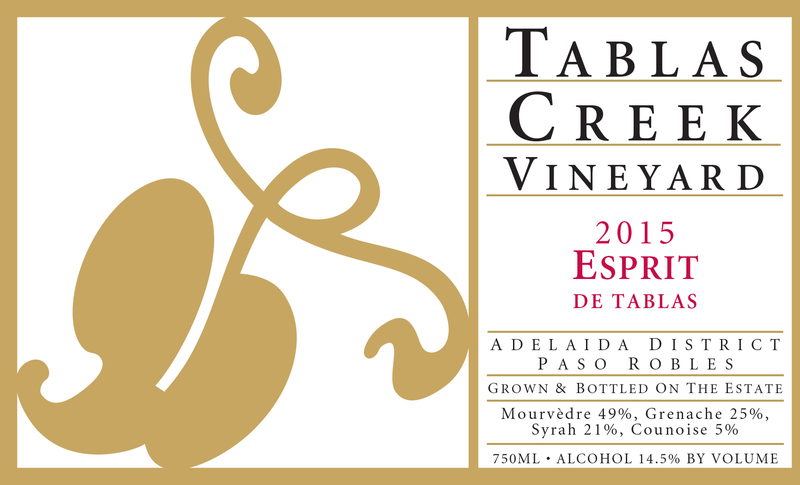 The Tablas Creek Vineyard 2015 Esprit de Tablas is a blend of four estate-grown varietals, propagated from budwood cuttings from the Château de Beaucastel estate. The wine is based on the dark red fruit, earth, spice and mid-palate richness of Mourvèdre, with additions of Grenache for forward fruit, approachability and lushness, Syrah for mineral, aromatics, and back-palate tannins, and Counoise for brambly spice and acidity. The 2015 Esprit de Tablas has an inviting nose of warm berry compote, given complexity by sun-drenched bay leaf and newly turned earth: Mourvedre at its most appealing. The mouth is lush and dense, with big but refined tannins, and flavors of licorice, blackberry, and cedar. Mourvedre's characteristic meatiness is in the background at this point, but just waiting for a few years in bottle to emerge. Alternatingly bright and deep on the finish, with lingering flavors of wood smoke, plum skin and spice. The 2015 vintage saw dramatically reduced yields from the combined effects of four years of drought and cool, unsettled weather during May's flowering. Months alternated between significantly cooler than normal and significantly warmer than normal, which produced an early start to harvest but required multiple passes through most vineyard blocks during a long, drawn-out picking season. Yields were down as much as 50% in early-ripening grapes like Grenache and Syrah, but later grapes like Mourvedre were only down slightly. The result was a vintage with excellent concentration and complexity from long hang-times, and wines with dramatic perfume, texture, and intensity. We harvested our Mourvèdre between September 24th and October 15th, Syrah between September 9th and October 5th, Grenache between September 10th and October 8th and Counoise between September 26th and October 14th. The grapes were fermented using native yeasts in a mix of 1500-gallon wooden upright fermenters, open-top tanks and closed stainless steel fermenters. After pressing, the wines were moved into barrel and allowed to complete malolactic fermentation. The Esprit was selected from the vintage's best lots and blended in May 2016, then aged in 1200-gallon French oak foudres for another year before being bottled in June 2017.